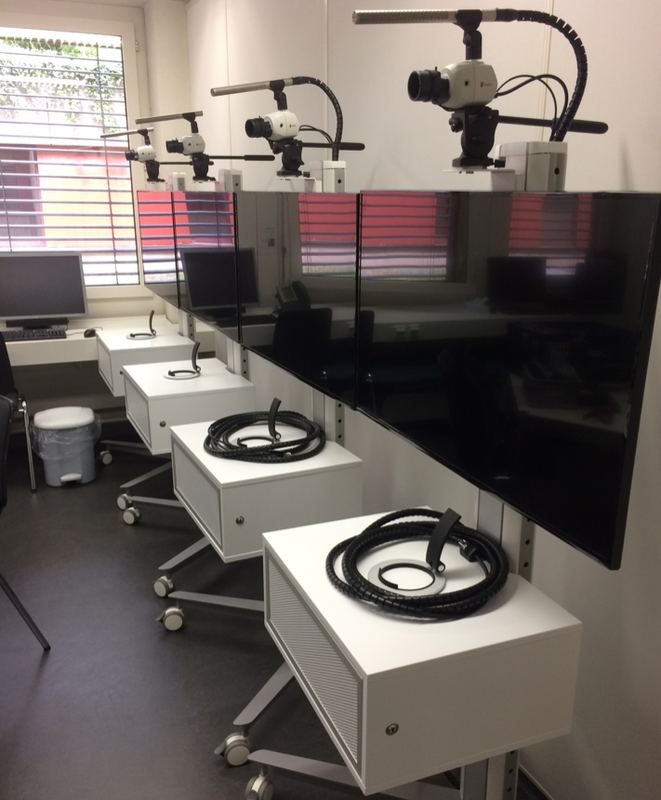 Bern University of Applied Sciences builds communication training stations and completes workflow with Cantemo Portal™, LMS and Archiware P5 Archive. Communication training is a core part of many industries as well as educational institutions. For customer contact, management, patient communication and many other scenarios, interactive training of these skills is needed. At Bern University of Applied Sciences in Switzerland, communication training of medical students with the goal of improving patient communication has been part of the curriculum for many years. Recently, a new infrastructure was built to streamline the trainings and their management. The growing importance of video for education and training called for an easy to use hardware and software solution that integrates recording, playing-back, storing and publishing of video data. The previous Windows XP-based system was unreliable and not integrated. There was no centralised storage for video data and DVDs were used to transfer and publish files. The aim was to build a future-proof, easy to use system that offers a seamless workflow from capture to reviewing, tagging, transcoding, data management and publishing to a learning management system (LMS). Recording stations should also be usable for other faculties. Halimedia was chosen as local partner with considerable experience in video workflows. The solution was built around a Cantemo Portal as a centralised media asset management (MAM) server to allow for efficient workflow automation, including archiving. 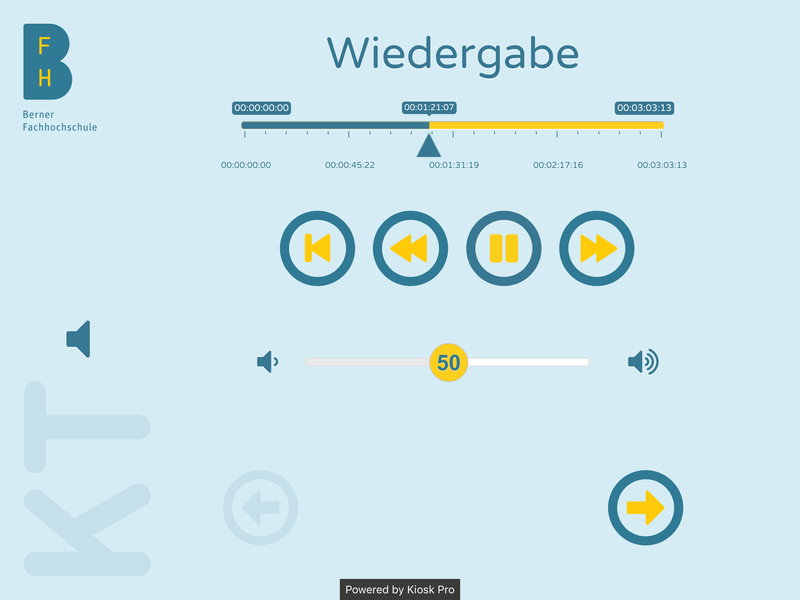 The video recording stations were built using highly reliable components and a web application was developed to allow remote control and tagging from iPads. Integration with existing planning tools was implemented to significantly reduce the management overhead of the training program. Over-all, ease of use and features surpass requirements. After switching on, the stations can capture video immediately. 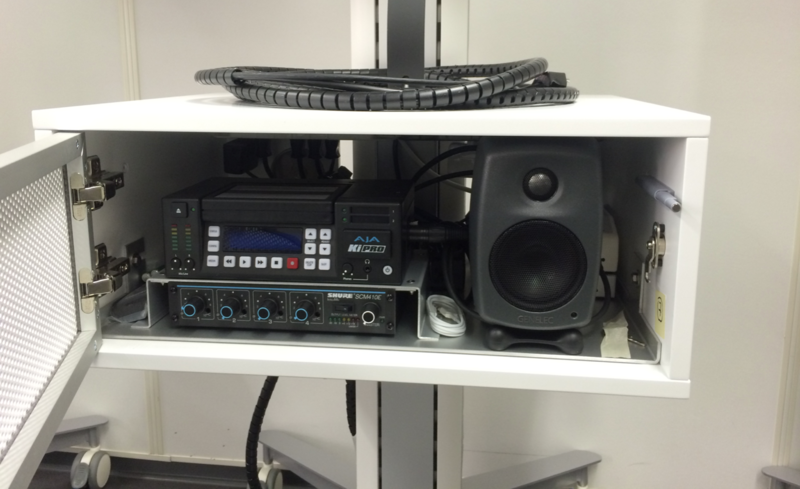 Recording and playback is remotely controlled via iPads and a web app that controls the AJA KiPRO recorders. Reviewing, rewinding and watching recordings is usually done many times during a training session. Videos are tagged with the names of students and standardised patients (actors) to allow control of the publishing destination of the final clip after transcoding and to facilitate salary payments, respectively. After the training session is completed, the captured videos and associated tags are transferred to Cantemo Portal. Once transcoding to the desired distribution formats is complete, the clips are made available in the centralised LMS. Cantemo Portal initiates an automated archive process that starts Archiware P5 Archive, writing all files for long-term preservation on LTO tape storage. The AJA KiPRO recorder was chosen for its extreme reliability, flexibility and remote control options. All relevant features of the KiPRO are remotely controlled by iPad, using the custom web application developed by Halimedia.